They're generally unsecured, so, unlike many forms of business borrowing, you don't have to put your house or other assets on the line. For careful users, they can offer low interest rates. They're often easier to get than other forms of commercial finance. Many come with smart applications that can cut down the administration time you have to spend managing them. 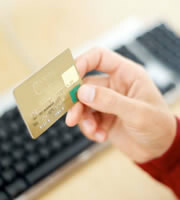 Rewards credit cards in this category can offer genuinely worthwhile, business-specific points and perks. However, this form of plastic was excluded from the Credit CARD Act of 2009, and lacks many of the statutory protections consumers have grown used to. So what should you bear in mind when applying for and using small business credit cards? The card may be in your company's name, but virtually all credit card companies insist that you take personal responsibility when you sign up for a small business credit card. That means that it's your own credit score that's likely to suffer if things go wrong. So be as cautious and conservative in your use of your business plastic as your are with your personal cards. Why are so many paying such high rates? Well, in this unregulated area of the market, many credit card companies have late-payment rate increases on a hair trigger. At least one has the right to impose penalty rates if you're just one-day late on any payment. Others might give you up to three-days lateness in a year before upping your rate to, say, 29.9 percent. Remember also that business credit card rates can be increased at will even if you do nothing wrong, and without the prior notice that must be given with consumer plastic. Suppose you're paying different rates on the same account. If you have a personal card, your issuer has to apply your payments to the higher or highest rate first, driving down your borrowing costs. There's no such legal obligation on business credit cards, and most issuers are likely to apply your payment to the balance attracting the lowest rate. Under the Credit CARD Act, consumers have to get a minimum of 21 days between the mailing of a statement and the next payment falling due. But some card issuers shorten that period for business products. You have to be careful that you note the date on each statement. And that's the trick really: be careful. Small business credit cards can offer real and valuable benefits for entrepreneurs. But you have to be aware of their possible pitfalls. In mid-January, New Jersey attorney Robin M. Gronsky wrote about how useful business cards are when it comes to tracking expenses, and reminded his readers of the tax advantages that identifying deductibles can bring. He also stressed the value to many small entrepreneurs of building a credit history for a business that's separate from their personal one. It can make subsequent borrowing from other sources much easier. ...when you use a business credit card for your small business' expenses and not your personal credit card, you are showing the world another way in which your corporation or LLC is a separate entity from you personally. This can be important if your company is ever sued and the plaintiff tries to pierce the corporate veil and sue you personally. So it's clear that, used responsibly, business credit cards can be extremely valuable tools for many entrepreneurs. 0 Responses to "Small business credit cards: Know the ropes"